So you’re shopping for a sofa, and you see this one in a store. In a different store, you see the one below. One sofa (the one on top) costs $3000; the other costs $1500. Why the wide disparity in price? Shopping for a sofa is fraught with anxiety – we don’t do it often (for most people it’s every 7 – 10 years) so we don’t know how to shop for it. Knowing what to look for, and how to evaluate a sofa, might take some of the anxiety away. And knowing a bit about the components and how they’re put together will explain some of the difference in price. It’s important to keep that in mind while you’re being seduced by the alluring upholstery, svelte arms and come-hither cushions. But if your darling’s joints are weak, springs loose and cushions flat, you’ll quickly lose that lovin’ feeling. Not to mention the additional chemical guests you’ll be inviting into your home with the sofa. Start by asking yourself questions such as who will use the sofa – will the kids dump themselves and their bags on it right after school or is it in a room that’s just used for entertaining? How long do you want it to last? Do you want to sink into the cushions or sit up straight? Nap on the sofa? And construction is … well let’s just say it’s not built to last. “Quality” translates into “useful life”. For simplicity, let’s assume the top sofa will last 20 years while the bottom sofa will last just 5. That would mean the top sofa costs $0.41/day while the bottom sofa costs $0.82/day = exactly double. The cost of owning the top sofa is half as much as the cost of owning the bottom sofa. Dr. Thomas J. Stanley, in his book The Millionaire Mind, observed: “By definition, millionaires tend to be accumulators, a trait they inherited from their parents who were collectors. Their parents and grandparents held on to things that had value. So the majority of millionaires have a family legacy of collecting, saving, and preserving. Waste not, want not is a theme acted out by first-generation millionaires today”. With regard to how this trait applies to buying furniture: They deliberately purchase furniture they can pass on to the younger generation. This, in essence, is their definition of quality furniture. It will outlive a person’s normal adult life span, will never lose its appeal, and will probably appreciate in value. A good quality sofa is an investment, like any other quality purchase that you expect to last. A very low cost sofa is probably made of engineered wood – such as plywood, particleboard, Medium Density Fiberboard (MDF) or glulam – all of which can legally be referred to as “solid wood products”. Engineered wood (or composite, man-made or manufactured wood) are made by binding the strands, particles, fibers or veneers of wood with adhesives – most often that means urea formaldehyde (a known carcinogen) and finished with polyurethane or aluminum oxide. In laymans terms, MDF (for example) is sawdust held together with glue. MDF has a life span of 1/10th to 1/4th that of solid wood, properly constructed – and costs about 1/10th to 1/4th that of solid wood. Cutting, sanding, or releasing particles of MDF into the air might be a high risk and should be avoided. If the MDF isn’t properly sealed, it can leak formaldehyde for years, pumping it into your home or office. Often manufacturers use wood veneers over MDF cores, and consumers have no idea that they’re not buying real wood. Veneers are also used on solid wood (usually a less expensive wood) –that has a similar property as the veneer, allowing them to swell and contract together with changes in humidity. They also respond similarly to stain and finish products. The bond between manufactured wood (MDF) and the veneer is not as strong or stable as that of the solid wood because MDF tends to respond more dramatically to changes in humidity and temperature, and is more rigid than solid wood, making the bond less durable. Recognizing solid wood veneer furniture is fairly simple. Look to the bottom and back edges of tabletops, drawers and shelves. Solid wood always has grain, whereas MDF and particleboard do not. These unexposed edges will not typically be veneered. Another thing which is often cited as a way to evaluate quality is to pick up the sofa – if it’s really heavy, it’s probably made of solid wood – or so the saying goes. However MDF is also very heavy – so weight alone cannot really be used as a test. At the next step up, soft woods (like pine) may be used. The highest quality furniture uses kiln dried hard wood, like ash, maple or poplar, which offer greater strength and stability. But not all wood is created equal: we think that it’s important to choose a wood that did not come from an endangered forest (such as a tropical forest), and preferably one that is sustainably managed, because forests, according to the National Resources Defense Council, are critical to maintaining life on Earth. And that’s something we should pay attention to! (See our post about wood used in furniture at https://oecotextiles.wordpress.com/2012/08/23/how-to-buy-a-quality-sofa-part-2-wood/ ) Wood certified by the Forest Stewardship Council (FSC) ensures that the wood used in your sofa was from a managed forest. SFI, an alternative certification created by the American Forest & Paper Association, allows such things as clearcuts, use of toxic chemicals, and conversion of old-growth forests to tree plantations. So the certifying body matters! How the wood is connected is important too. Lower cost sofas are often stapled together, or you’ll get plastic legs screwed into the frame instead of wooden legs that are part of the posts or bolted into the frame. Give it a year or two and the arms get loose or the frame wobbles. Higher cost sofas are held together with glue and dowels or tongue-and-groove joints, making the joints even stronger than the wood itself. Corner blocks (in each corner of the frame, near the legs, an extra piece of wood joins the two side rails) are important. Finally, the wood is often stained or varnished – both of which emit harmful VOC’s of various kinds, depending on the stains or varnishes used. A safe alternative is to ensure that the stains/varnishes used don’t emit harmful VOC’s such as formaldehyde, and are formulated without aromatic solvents, heavy metals in the pigments, toluene solvents or other harmful chemicals. The suspension system determines the bounce in the cushions, and how they support your weight when you sit on them. The differing degrees of pressure your body puts on the cushions causes the coils to respond, giving what is known as “ride”. Generally, the higher the number of coils, the better the ride. The gold standard has always been the labor-intensive, 8-way hand-tied spring system. It’s expensive to do it right, and few companies do. When done correctly each spring is set into the deck webbing and attached, with various spring rates depending on what portion of the seat deck its located. They are then tied together (8 strings per piece) and knotted at each juncture (not looped! – only knotting keeps the spring deck together if a string breaks). Much has been said about how eight-way hand-tied spring-up systems are superior to any other kind. “It’s a sacred cow in the industry,” says Professor C. Thomas Culbreth, director of the furniture manufacturing and management center at North Carolina State University . But not all eight-way hand-tied spring-ups are built the same way, and the sinuous spring – or S – system, will last just as long, and for most people the comfort level is the same. Sinuous springs are “S” shaped and run from the front of the seat to the back. These springs are supported by additional wires that cross from side to side. The S springs lack the localized response of a coil system but gives a firm ride that some people prefer, and it has less potential for sagging over time. It also makes for a strong seat, and it might be the preferred option in a sleeker style as it requires less space. Next week we’ll tackle cushions, because that’s, as they say, a whole ‘nother ballgame. A current theme in the blogosphere is that organic sofas are expensive, so let’s see what that could mean. We often hear that organic stuff costs more than conventional stuff, and that only the rich can take advantage of the benefits of organic products. That is true of food prices – organic food typically costs from 20% to 100% more than conventionally produced equivalents. And I won’t go into what we seem to be getting in return for buying the cheaper, conventionally produced foods, but let’s just say it’s akin to a Faustian bargain. But look at the food companies which in the 1950s routinely produced laughably inaccurate adverts trumpeting the health benefits associated with their products. Those old school adverts, ridiculous as they look now, displayed an awareness that healthy food resonated with modern consumers, and heralded the start of a 60 year long transformation that has seen nutrition become the issue that arguably defines the way the food industry operates. It is entirely conceivable that the raft of new green marketing campaigns that have emerged in recent years mark the beginning of a similar journey with other product categories. So enough about food – this is a blog about textile subjects. And like food, organic fibers are also more expensive than non-organic. There is no way to get around the fact that organic cotton items are anywhere from 10 to 45 percent more expensive than conventional cotton products. But conventional cotton prices don’t take into account the impact that production has on the planet and the many people involved in its manufacture, including sweatshops and global poverty. With organic cotton, you are paying more initially, but that cost is passed not only to the retailer, but to the weavers, seamstresses, pickers and growers who made that item’s production possible. In turn, you are also investing in your own health with a garment that will not off-gas (yup, just like toxic paints) chemicals or dyes that can impact all of your body’s basic systems. Organic sofas often use FSC certified hardwoods – which means you’re supporting a resource which is managed so that the forest stays healthy. Forests are critical to maintaining life on earth: they filter pollutants from the air, absorb CO2, purify the water we drink, and provide habitat for both animals and some indigenous cultures. Forest certification is like organic labeling for forest products. Conventional sofas, on the other hand, often use composite plywoods, medium density fiberboard (MDF) or Glue Laminated Beams (Glulam). These products are glued together using formaldehyde resins. And formaldehyde is a known human carcinogen. The hardwoods are more expensive than the other options, but they don’t have the formaldehyde emissions. 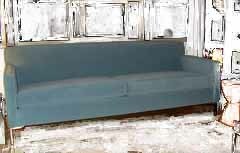 Conventional sofas almost exclusively use polyurethane foam – or that new marketing darling, soy foam. Polyurethane and soy foams are much cheaper than natural latex, but they are made of methyloxirane and TDI, both of which have been formally identified as carcinogens by the State of California and are highly flammable, requiring flame retardant chemicals. 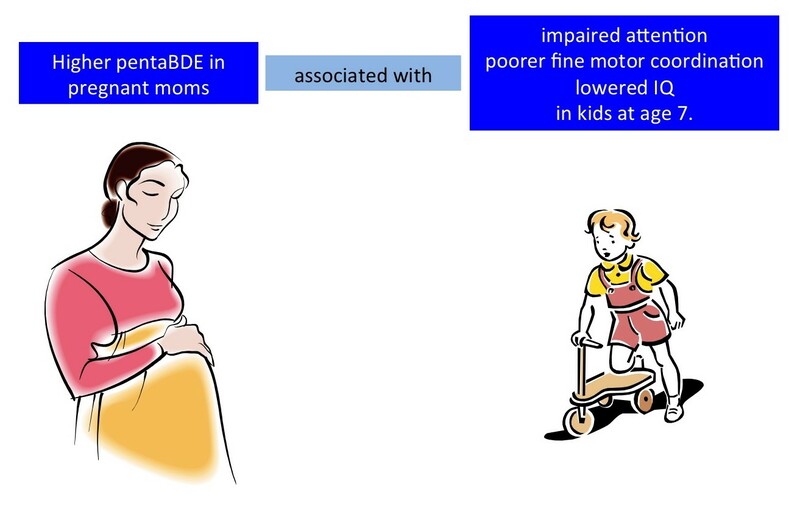 They also emit toluene, a known neurotoxin. The foam oxidizes, sending these toxic particles into the air which we breathe in. But they’re cheap. Natural latex, on the other hand, does not impact human health in any way, and it lasts far longer than polyurethane or soy foams. 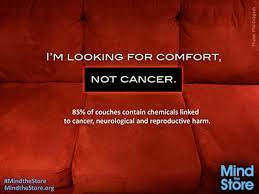 Organic sofas use fabrics that do not contain chemicals which can harm human health. Fabrics are, by weight, about 25% synthetic chemicals, and textile processing uses some of the most dangerously toxic chemicals known. Many studies have linked specific diseases with work in the textile industry – such as autoimmune diseases, leukemia and breast cancer. Organic fabrics do not contain these dangerous chemicals, so you won’t be exposing yourself and your family to these chemicals. Auxiliaries, such as glues and varnishes, have been evaluated to be safe in an organic sofa. Polyurethane or soy-based foam – which off gasses its toxic witch’s brew of synthetic chemicals and flame retardants. Non FSC certified hardwood (if you’re lucky), or composite plywood, MDF or Glulam, which offgasses formaldehyde. Conventionally produced fabrics that expose you and your children to chemicals that may be causing any number of health concerns, from headaches and allergies to changes in our DNA. Glues, paints and/or varnishes which off gas volatile organic compounds. As to price: let’s take a look at one sofa manufacturer with whom we work closely, Ekla Home (full disclosure: who uses our fabric exclusively) – the average price of Ekla Home’s sofa collection (assuming the most expensive fabric category) is $3290. That’s $1,336 LESS than the average of the sofas in the Remodelista post, none of which are organic. “It’s tempting to tell ourselves this little story about being frugal as we buy garbage from WalMart instead of the quality stuff that we want. Stuff that lasts. Stuff that we can own for a long time. So I’m a bit flummoxed as to why people complain that organic sofas are expensive. Expensive compared to what? If I was paranoid, I’d think there was some kind of subtle campaign being waged by Big Industry to plant that idea into our heads. Chemicals and synthetic pesticides reduce the cost of production by getting the job done faster and more efficiently. Without them, organic farmers have to hire more workers for tasks like hand-weeding, cleanup of polluted water, and the remediation of pesticide contamination. Demand overwhelms supply: Americans claim they prefer to eat organic foods, yet organic farmland only accounts for 0.9% of total worldwide farmland. Animal manure and compost are more expensive to ship (this is their list, not mine!) and synthetic chemical equivalents are very cheap. Instead of chemical weed killers, organic farmers conduct sophisticated crop rotations to keep their soil healthy and prevent weed growth. After harvesting a crop, an organic farmer may use that area to grow “cover crops,” which add nitrogen to the soil to benefit succeeding crops. In order to avoid cross-contamination, organic produce must be separated from conventional produce after being harvested. Conventional crops are shipped in larger quantities since conventional farms are able to produce more. Acquiring USDA organic certification is no easy — or cheap — task. In addition to the usual farming operations, farm facilities and production methods must comply with certain standards, which may require the modification of facilities. Employees must be hired to maintain strict daily record-keeping that must be available for inspection at any time. And organic farms must pay an annual inspection/certification fee, which starts at $400 to $2,000 a year, depending on the agency and the size of the operation. Last but not least – subsidies. In 2008, farm subsidies were $7.5 billion, compared to organic and local food programs which received only $15 million. Many say that if Americans who profess to want to buy organic food would stop going to fast-food restaurants, convenience stores, and buying processed, packaged and pre-made foods, they could easily afford organic foods.